While Tyrone was serving in the military during World War II, Gregory Peck had begun a career in Hollywood, working at 20th Century-Fox, MGM, and other studios. 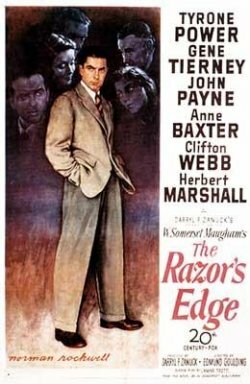 Darryl F. Zanuck had bought the rights to Somerset F. Maugham's best-selling novel, The Razor's Edge, and decided that Peck would be Larry Darrell. Maureen O'Hara was slated to star as Isabel. Zanuck changed his mind, though, deciding that Ty was the perfect Larry Darrell. He decided to hold out on making the movie until Ty's return. When Ty received news of his first post-war movie, he sent a telegram telling Zanuck that he was most eager to get back and do the movie. After he had written that telegram, another of the 20th Century-Fox decision makers had suggested going with another actor. 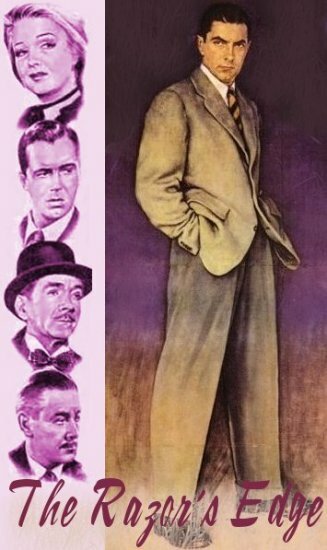 Zanuck wrote back that there could be no changing of the lead actor; that he had received Ty's telegram, and that he was eager to play the role of Larry Darrell. Zanuck spared no expense in gathering a solid, star-studded cast, along with A-list crew, to make sure that the movie would be a huge success. Gene Tierney was chosen to be Isabel. Anne Baxter, an actress greatly admired by Ty (and his co-star in the pre-war Crash Dive) was chosen to be Sophie. Clifton Webb would be Elliott Templeton, and Herbert Marshall would be Somerset Maugham. Fine actors were also chosen to be the supporting players. Edmund Goulding, the highly respected director, was chosen to direct. As a special touch, Oleg Cassini, then-husband of Gene Tierney, designed her costumes. Alfred Newman devoted six weeks to writing the score for the film. Lamar Trotti was chosen to do the screenplay for the movie. He wrote screenplays; then re-wrote them. Meanwhile, Zanuck thought it would be best for Ty to keep busy, rather than sit around and wait for the filming of The Razor's Edge to begin. To fill his time, Zanuck asked him to prepare to film The Dark Wood, with Otto Preminger directing. Maureen O'Hara would be his leading lady. Preproduction problems, however, caused the film to eventually be shelved. Zanuck then put him in a Red Cross Drive short. Ty also made a good-will flight to several Latin American countries in his own plane, "Saludos Amigos". Finally, Trotti had a script ready that pleased Zanuck, and the filming could begin. Ty and Annabella were legally separated in November 1946, when the movie premiered at the Roxy Theatre in New York. Ty invited her to attend the premiere, however, and she did so. All Zanuck's efforts to make the movie top-notch paid off at the boxoffice. 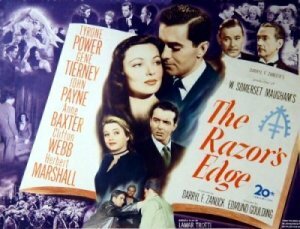 The Razor's Edge was a smash hit!